In 1973, Congress overcame President Nixon’s veto to enact the War Powers Resolution. That law was intended to restore the Founder’s vision of cooperative war-making authority between the two political branches. Since that time, two areas of uncertainty have plagued the efficacy of the law: the arguable intrusion into the exclusive war-making authority of the President; and the uncertainty as to what events trigger the law’s obligations. In an effort to cure these defects, a group of experts recently proposed adoption of a substitute law: the War Powers Consultation Act of 2009. This proposed successor statute shifts the focus of statutorily mandated inter-branch war powers cooperation from the express authorization emphasis of the War Powers Resolution to notification and cooperation. While this shift in emphasis is both logical and more aligned with historical constitutional practice than the War Powers Resolution, the proposal still struggles to define an effective trigger for this notification and cooperation mandate. 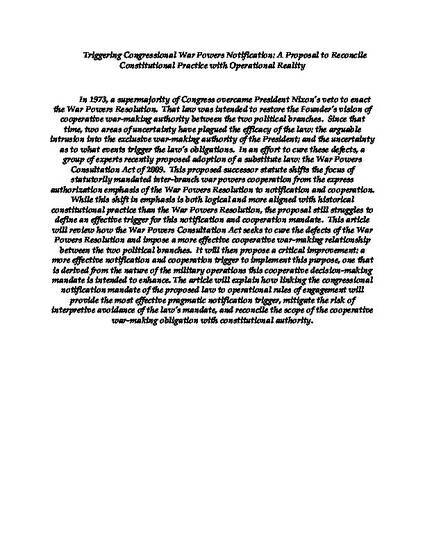 This article will review how the War Powers Consultation Act seeks to cure the defects of the War Powers Resolution and impose a more effective cooperative war-making relationship between the two political branches. It will then propose a critical improvement: a more effective notification and cooperation trigger to implement this purpose, one that is derived from the nature of the military operations this cooperative decision-making mandate is intended to enhance. The article will explain how linking the congressional notification mandate of the proposed law to operational rules of engagement will provide the most effective pragmatic notification trigger, mitigate the risk of interpretive avoidance of the law’s mandate, and reconcile the scope of the cooperative war-making obligation with constitutional authority.